Lucile Packard Children’s Hospital Stanford (LPCH) welcomed its first patients to its new state-of-the-art hospital December 9 as more than 100 pediatric patients and their families moved from the existing West building into the new Main building addition, marking a new era of exemplary pediatric care in Northern California. The move-in followed a ribbon-cutting and dedication ceremony November 30, where hospital leadership, elected officials, community partners, donors and patients’ families celebrated the successful completion of the multi-year planning, design and construction process. 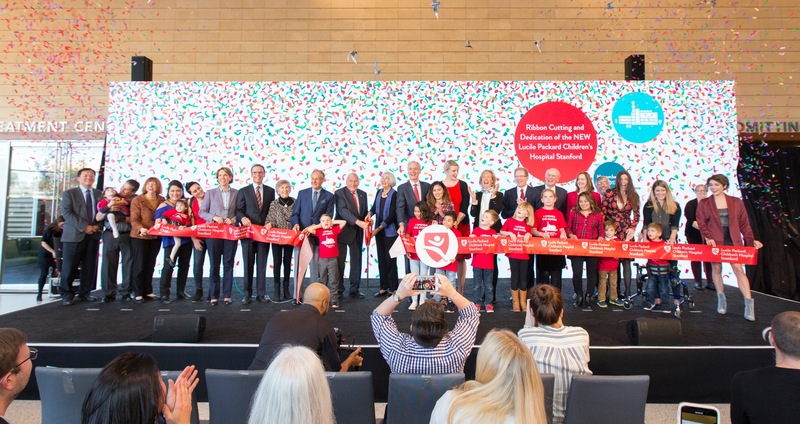 “Hundreds of staff have prepared for months and months for this day, when this new building becomes part of our working hospital,” said Christopher G. Dawes, President and CEO of the Hospital and Stanford Children’s Health, at the ribbon-cutting. Designed by HGA (Executive Architect and Medical Planners) and Perkins+Will (Design Architect and Sustainable Design), the hospital achieves key goals established by Stanford Children’s Health—all focused on creating America’s most technologically advanced, family-friendly and environmentally sustainable hospital for babies, children and expectant mothers. The 521,000-square-foot Main building more than doubles the size of the existing pediatric and obstetric hospital. The new Main building includes a connecting bridge corridor stretching from the West building; 149 patient beds for a total of 361; and a Treatment Center featuring surgery, radiology, imaging center with combined PET/MRI, interventional, catheterization labs, and nuclear medicine. (The surgical suites and neuro-interventional and catheterization labs will open mid-2018). With an emphasis on holistic healing, the hospital embraces Evidence-Based Design features, such views of nature, access to the outdoors, and abundant natural light. All patient floors feature outdoor patios that overlook 3½ acres of landscaping and gardens that “let the outside in,” including the Emerald Garden with a sea-themed play area, the Dunlevie Garden between the Main and West buildings with educational sculptures, a Healing Garden adjacent to a Sanctuary, and a staff-only garden. Other amenities include locally grown food served in the Harvest Café, regionally crafted art in common areas, a Family Resource Center, and a Story Corner where children can read or listen to storytelling. Additionally, the wayfinding system is based on California’s ecoregions, featuring colorful wall art, educational signage and nature graphics that help patients and families navigate the hospital units while learning about the local environment. “Sustainability and environmental consciousness are seamlessly woven into the experience of the building—from energy and water use dashboards and salvaged local redwood to harmonious integration of outdoor nature experiences,” noted Robin Guenther, FAIA, LEED AP, Sustainable Healthcare Design Leader with Perkins+Will. Sustainability innovations include water-efficient landscaping and water collection systems, creative use of recycled and reclaimed local materials, and a unique external shading system to reduce the need for air conditioning. In fact, LPCH anticipates using 38 percent less water annually (saving nearly 800,000 gallons of water annually) and 60 percent less energy than the average Northern California hospital. The building’s ongoing water and energy usage will be displayed on an electronic dashboard in the main lobby and on bedside entertainment systems, allowing children to compare energy consumption in different areas of the hospital. The building is on track for LEED Gold certification. 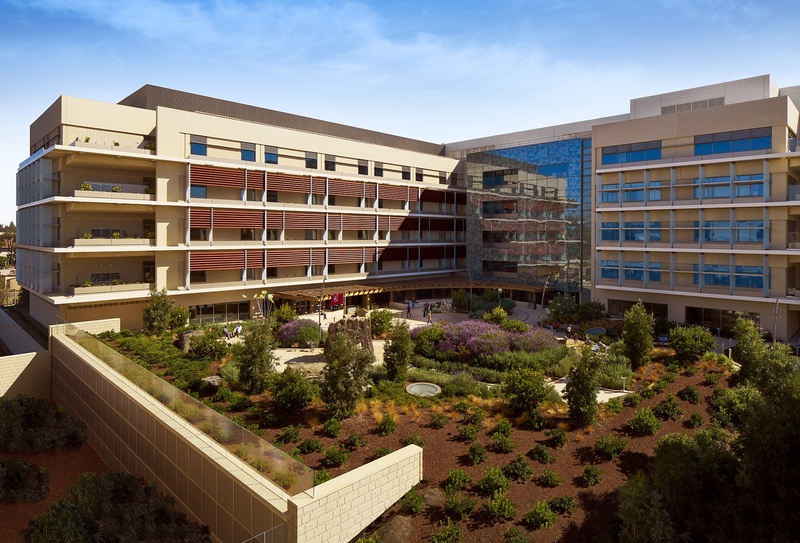 “Reflecting Northern California’s commitment to environmental sustainability was an integral part in the new hospital’s design,” said Dawes, President and CEO. In planning the medical spaces, HGA focused on creating a comfortable atmosphere for children and their families while incorporating operational efficiencies to promote superior care. In each nursing unit, caregivers have direct sightlines from their workstations into patient rooms. The appearance of heavy equipment within the patient rooms is minimal, making the rooms less intimidating for children. Sinks, water coolers and other amenities are built at child height. Patient rooms provide additional privacy and space for patients and their families, with sleeping accommodations for two family members. In addition, every patient floor includes a family lounge, child life room, patient-family kitchen, and laundry facilities to help promote a home-like environment. Co-location of medical services, including the merging of imaging and surgery platforms in the Treatment Center, increase efficiency in processes and result in less travel time for anesthesiologists. Staff circulation routes are separate from patients and their families, and medication alcoves located outside of patient rooms decrease the amount of time caregivers need to retrieve medication while keeping the main hallways clear of pedestrian traffic. Pharmacy spaces are in the same location on every floor, allowing for a shared lift to optimize efficiency. 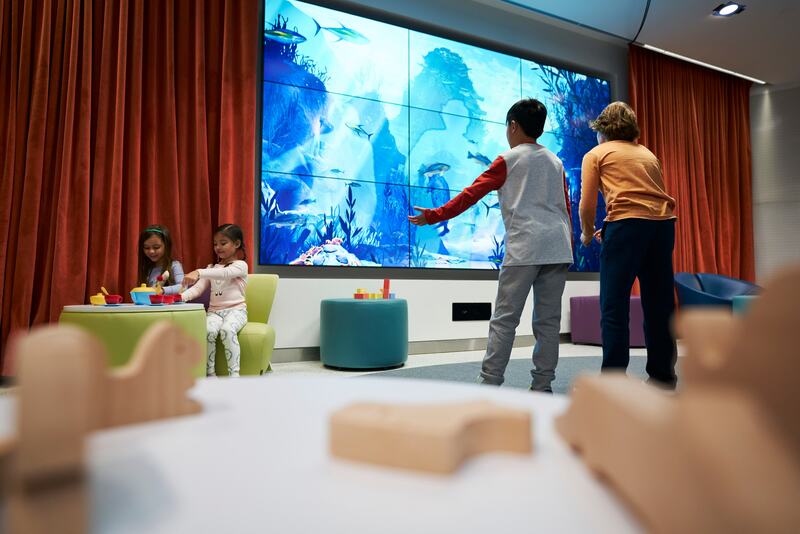 As completed, Lucile Packard Children’s Hospital Stanford establishes innovative approaches to children’s health and wellbeing, setting national benchmarks for care, sustainability, and community engagement. Learn more at Lucile Packard Children’s Hospital Stanford.